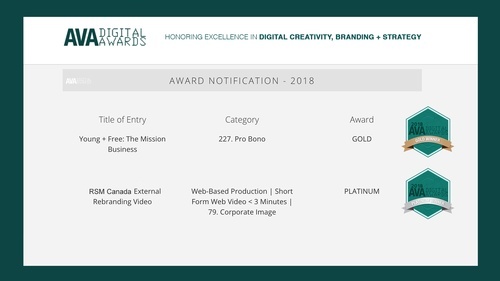 Arc and Crown Media is proud to announce that that two of our videos, “RSM External Rebrand” and “Young + Free: The Mission Business” are award-winning recipients of this year’s AVA Digital Awards for the “Corporate Image” and “Pro Bono” categories. The AVA Digital Awards is an international competition that recognizes the excellence of creative professionals around the world who are responsible for the concept and planning, direction, design and final production of digital communications content. Award-winning applicants range from a whole spectrum of mediums, including digital engagement campaigns, audio and video production, website development, social media interaction, and mobile marketing. Young + Free was a pro bono series produced by Arc + Crown that gave young, aspiring entrepreneurs and forward-thinkers a chance to take the spotlight and share their strategies for success to the rest of the world. The winning episode features Trevor Haldenby, futurist at The Mission Business, a one-of-a-kind “adventure laboratory” that creates immersive experiences for innovative companies to shake up and embolden their perceptions of the future – they call this “adventure coaching.” Theirs was a courageous endeavor, to bring theatre acting into the corporate realm, and employ narrative and storytelling to drive business growth, expectations, and culture. In the video, Trevor speaks about one of Mission Business’s largest undertakings, a public art project that simulated a biologic apocalypse called Z.TO Byologic. The goal was to ask, “in the event of the end of the world, how do we work together to stay alive?” Under the extreme duress of life and death, participants found camaraderie and teamwork amongst each other, and learned what effect working together in a constructive manner produced. The Z.TO movement was the calling card for Mission Business that defined them as a company, and proved that entrepreneurs need to seize risk and embrace the new, unexplored and unknown if they want to move forward and succeed. At Arc and Crown Media we’d like to thank RSM, The Mission Business, and the AVA Digital Awards for these amazing opportunities to tell your award-winning stories and compete alongside other award-winning international digital content companies. These are the stories we want to tell, and we are so glad you brought them to us. To see more AVA Digital Awards winners, check the link here. To contact us about your video needs, you can contact us at our home page here.